"The Greater Boston Manufacturing Partnership (GBMP) has been our trusted partner in guiding us ​along the Lean journey. Their expertise in the field of continuous improvement and the Toyota Production System has greatly increased our collective knowledge base. Working together, we are providing a fertile ground for Raytheon's culture of Total Employee Engagement to accelerate business growth." DISCOVER EXCELLENCE is a two-day workshop that introduces the Shingo Model, the Guiding Principles and the Three Insights to Enterprise Excellence™. With real-time discussions and on-site learning at a host organization, this program is a highly interactive experience. It is designed to make your learning meaningful and immediately applicable as you learn how to release the latent potential in your organization and achieve enterprise excellence. Join us on June 4-5, 2019 at The Gem Group in Lawrence MA! Read more & register here. 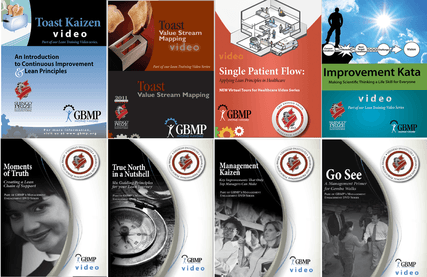 Watch the brief video at left for an overview of ​GBMP's Lean training services and workforce development philosophy. ​"Continuous Improvement is a philosophical and methodological approach to business that strives to provide ever-increasing value to the customer through total employee involvement in the reduction of non-value added wastes and their associated costs. Continuous improvement is not about the things you do well - that's work. Continuous improvement is about removing the things that get in the way of your work. The headaches, the things that slow you down, that's what continuous improvement is all about." ​clips and order your copies today.